How to Play Crazy Freekick game? 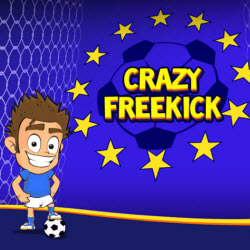 Play Crazy Freekick and show how to kick a soccer ball using your amazing kicking skills. You need to select your favorite team and stop the bars using the space bar or mouse to select the point to hit the ball. This is a time-based game – the bonus multiplier decreases as the time increases. So, try to score high making perfect goals in this amazing soccer game. This Online website is providing other game like Education games– Sports game-Casino game- Adventure game-Puzzle Game- Car Race Game-Action Game, this type of games are absolutely free to play.